The 3/4" scale, 3-1/2" gauge USRA D-30 class 0-6-0 switcher, nearly complete except for cab and tender, as designed by H.J. Coventry in 1949, and illustrated in The Miniature Locomotive Magazine in 1954. Here's what the prototype looked like. From this, you'll have an idea of the size, looks, and proportions of the 3-1/2" gauge version. Designed by Mr. Coventry to be machined on a 9” South Bend Lathe. Even the cylinders machine in the lathe! (A small milling machine, a mill-drill, or a lathe milling attachment, can handle the other milled parts). NO COMPLEX “STEP” BORING the clearances in the valve chamber; and no “crazy-shaped” valve liner to machine. 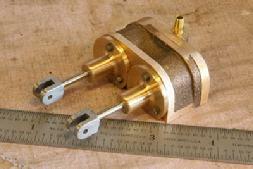 The valve bore, and liner, are machined parallel. Mr. Coventry’s original construction notes, including instructions for easily holding the cylinders on a faceplate in the 9” South Bend lathe and machining them; sketches and descriptions of the various jigs and fixtures used; and instructions and sketches on how to construct the boiler and combustion chamber, are available. 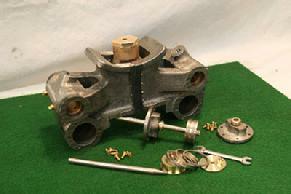 The 3/4" scale D-30 class USRA 0-6-0 cylinders (with valve crossheads, in bronze, also shown). Half-saddle, piston valve, exhaust ports cored. Steam and exhaust clearances in valve bore also cored, thus eliminating complex "step" boring operations within the bore. Proudly made in New England, USA. All shipping prices are for USA shipping. For Canada and overseas, please inquire. Complete set of drawings, copied from Mr. Coventry's originals.....$299.00 plus $25 shipping. Copies of Mr. Coventry's original construction articles are available for $30 plus $8 shipping. They detail many aspects of construction, including: cylinders, drive wheels, boiler, and valve gear. Cylinders, pair. 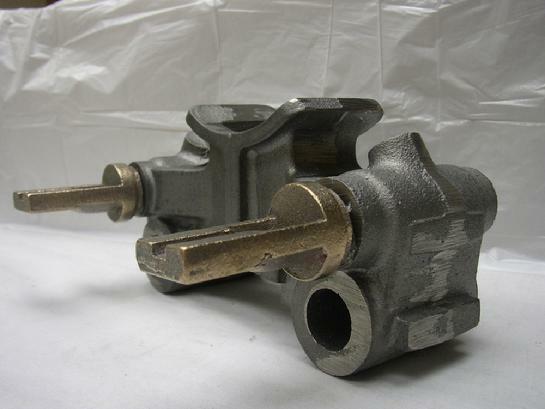 (Half-saddle piston valve type. All ports cored). If more than one section of castings is purchased at once, shipping will be consolidated and credit given to your PayPal account or credit card, for any shipping overpayment. You may also pay by check or money order, or, by regular credit card not through PayPal. Please inquire. 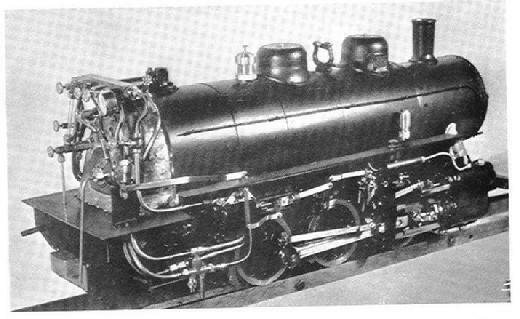 A front view of the 3/4" scale USRA switcher being built by George W. of Canada. 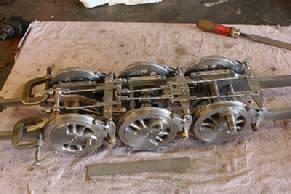 The 3/4" scale USRA 0-6-0 switcher as being built by Jack Bodenmann of California. Here are the brake cylinders and components after machining, and ready for assembly. 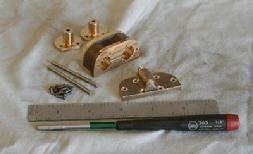 The brake cylinder and its components, machined and assembled, and ready for installation. The locomotive is equipped with steam-powered brakes controlled from the cab. This rare underside view of the chassis, shows the brake rigging. Three photos and phenomenal machining on the brake section by Jack Bodenmann, California USA. 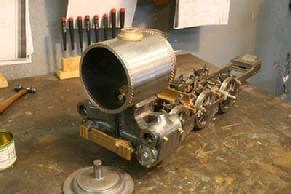 The finished cylinders for the 3/4" scale 0-6-0 USRA switcher. Superb machine and assembly work by Jack Bodenmann, California USA.